Want to know the easiest way to turn up the dial on chicken dinners? 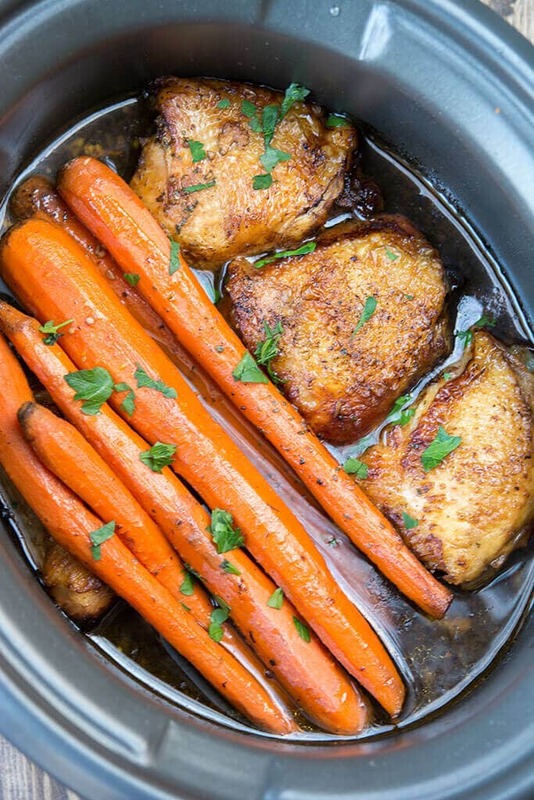 Try this classic recipe with a twist, Slow Cooker Balsamic Chicken with Carrots! A healthy and tasty dinner with a beautiful presentation that will have everyone’s mouth watering before you get it to the table! As much as I love coming up with, and sharing, seemingly random recipes I’ve created out of my love for trying unusual food combinations (like Pulled Pork Nachos topped with pomegranate arils and goat cheese sauce, or jalapeño popper style chicken turned into Flautas topped with blueberry and peach salsa), I also love cooking up back to basics style recipes with just enough of a twist to keep them interesting. 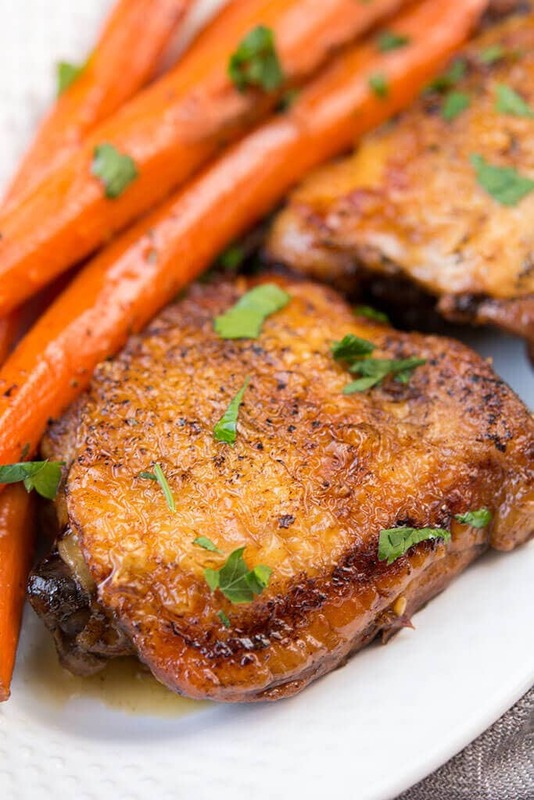 Recipes like this Slow Cooker Balsamic Chicken that are simple to make, tasty and have just the right combination of ingredients to keep you from getting bored with dinner. When you are just trying to get dinner on the table at night, do you spend time thinking about the presentation of the food? I don’t think most of us do, we are focused on the practical aspect of the cooking and getting hungry people fed as soon as possible! But take a minute to consider how we truly eat with our eyes first. When the food looks appealing we are pretty excited to dig in. 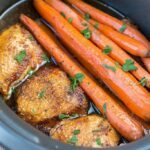 A few quick steps will dress up this Slow Cooker Chicken with Carrots, and even make your prep work easier! Keep the carrots whole instead of chopping, this allows you to throw everything in the slow cooker in no time at all. Also, it makes for a much prettier presentation! 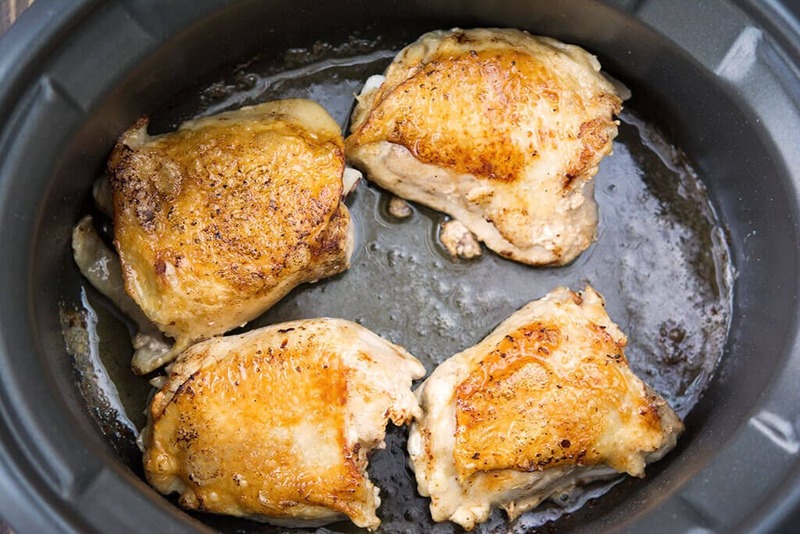 I also think it’s fairly important in this recipe to brown up your chicken thighs a tad before slow cooking because crispy browned up chicken is so much more appealing. Have you had a chance to try this multi-cooker? It is staple in my kitchen and makes clean up a breeze while allowing me to put attractive, delicious and healthy food on the table! A simple sauce using ingredients that you can easily keep on hand and you have a beautiful slow cooker dinner (yes, slow cooker food can be beautiful!) that I know you will be proud to serve! 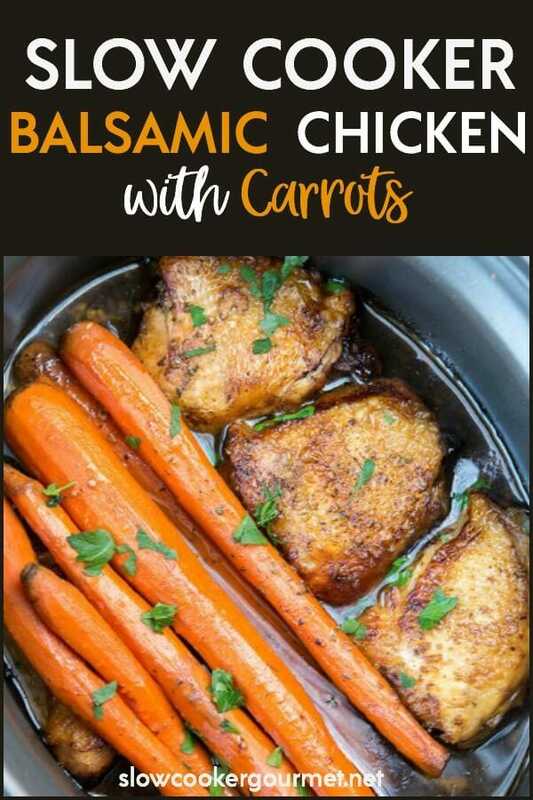 Want more ‘Back to Basics with a Twist’ style recipes like this Slow Cooker Balsamic Chicken with Carrots? Try these! Want to know the easiest way to turn up the dial on chicken dinners? 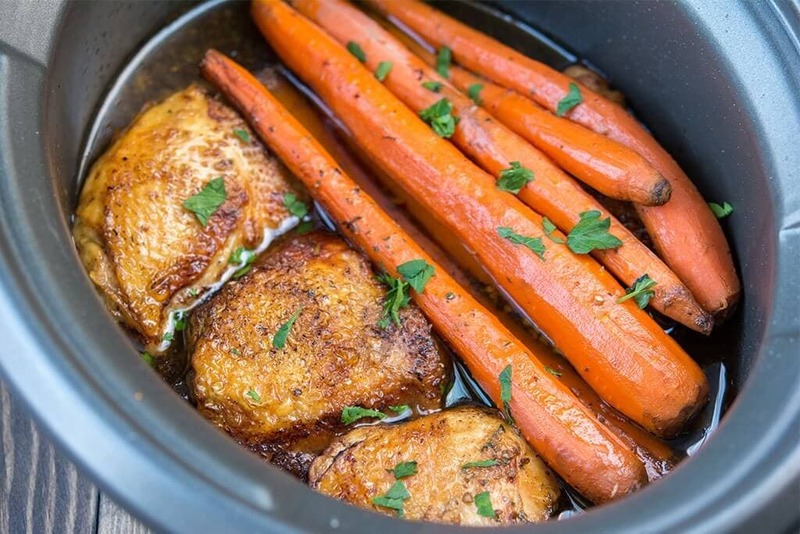 Try this classic recipe with a twist, Slow Cooker Balsamic Chicken with Carrots! A healthy and tasty dinner with a beautiful presentation that will have everyone's mouth watering before you get it to the table! I cooked this on high in my 4 quart multi-cooker for 4 hours. Local raw honey is my favorite in this recipe, try out some from your area and see if you like it! I’ve made something similar for years. Chicken breast raw in the bottom of the crockpot, add quartered potatoes and a bag of baby carrots. Pour an entire bottle of lite balsamic honey dressing over the whole thing. Cook on low 7-8hrs. SO so good! I want to make this tonight! But I dont have carrots. But I have asparagus? Would that be any good? I’m still a little knew to the housewife life lol and would I need to adjust the cook time? I think I would roast the asparagus separately with a little olive oil, lemon and salt and serve along with the chicken. Let me know how it turns out! Would throwing in potatoes as well work so that it could be a complete meal? What do you tend to serve you yours with? Yes! We also like to serve ours over steamed white or brown rice. This my husband’s favorite!! 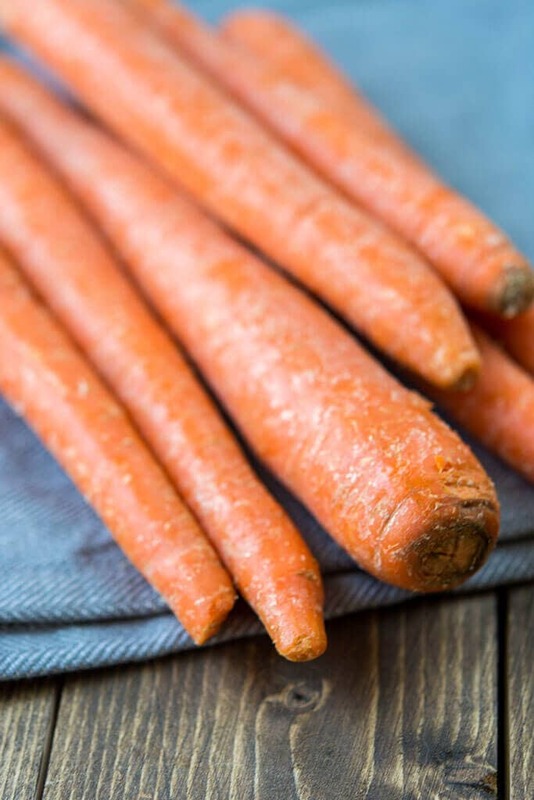 It’s so yummy and juicy and the kiddos love the roasted carrots. After we ate everything I used the left over juices to roast more carrots. Thanks for a easy and tasteful meal. I love that your whole family enjoyed this recipe! Thanks for letting us know, Kimberly! if you have to make anything in a skillet, then it’s not a truly convenient slow cooker meal. the whole point is to stick everything in and then go to work, come home and eat. That is one of the greatest features, but of course there are other ways to use it to 🙂 Have you tried a multi-cooker? Although if you only want a “dump and go” meal that may not work well either. Might be worth a try to see if you enjoy some additional recipes, you never know! Just made this for dinner. Thanks for the great recipe – so easy and tasty. I decided to use the slow cooker more this year so have been looking for some new recipes. 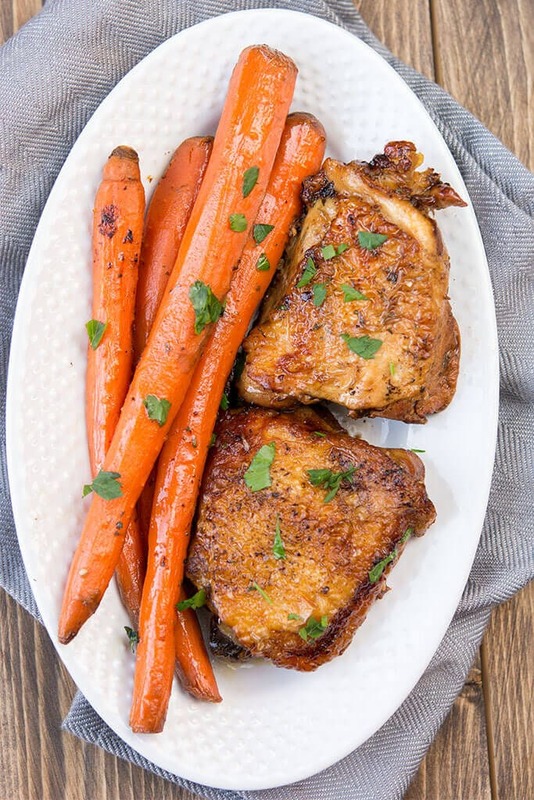 Instead of browning the thighs, I just put the raw chicken in the slow cooker, topped with carrots. Then I combined the remaining ingredients, including the butter, and poured it over the chicken and carrots. (I used agave instead of honey.) Yummy! We were thinking this would also be great with pork chops. That will probably be on the menu in the future. Thanks Phyllis! Glad you loved it. And you are so right, it would be delicious with pork as well! Hi! Has anyone tried this with chicken breasts? I’m in a pinch and don’t have thighs. You think it would come the same or should I adjust the cooking time? Hi Karen! So sorry, I’ve been out taking care of back to school stuff all afternoon and am just seeing this. Did you make it tonight? Chicken breasts should be fine as long as they are bone-in. Why with the bone? Does it help with cooking? It helps to keep the chicken from drying out and gives it a lot more flavor.